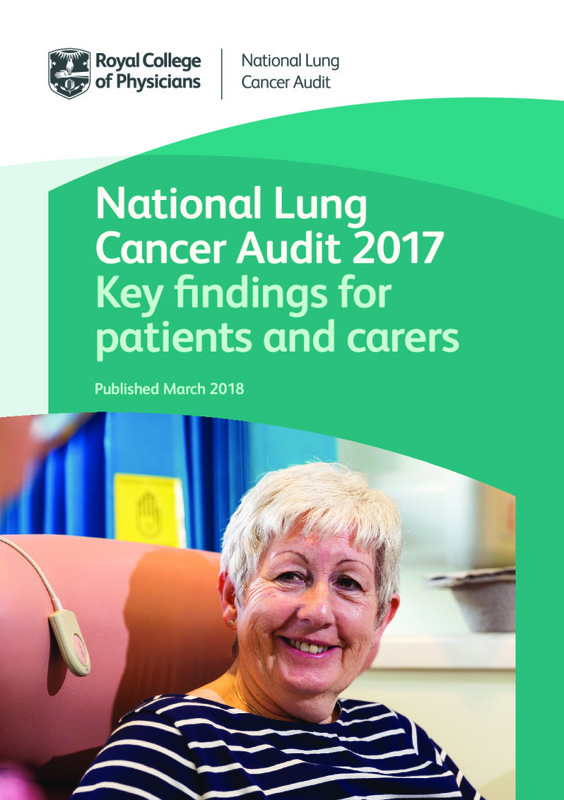 This booklet provides a summary of key results from the 2017 National Lung Cancer Audit (NLCA) annual report, which looked at patients who were diagnosed with lung cancer between 1 January and 31 December 2016. The results are based on data from 140 English NHS trusts and 13 Welsh hospital sites. The booklet specifically looks at how organisations performed in key areas of the patient pathway. It does not include information on the types of treatment or drugs that are available to patients with lung cancer. The data are based on patient-level information collected by the NHS as part of the care and support of patients with lung cancer. English NHS trusts submit patient data via the Cancer Outcomes and Services Dataset (COSD). These data are then sent to the National Cancer Registration and Analysis Service (NCRAS) (which is part of Public Health England (PHE)), where they are combined with different datasets to make the information as complete as possible, to better analyse the patients’ entire pathway. The data are collated, maintained and quality assured by the NCRAS. In Wales, data are collected through the Cancer Network Information System Cymru (CaNISC), and an extract of the data is then submitted to the NLCA. To download the booklet click on the link below.